There is a tendency to consider all refugees as 'vulnerable victims': an attitude reinforced by the stream of images depicting refugees living in abject conditions. This groundbreaking study of Somalis in a Kenyan refugee camp reveals the inadequacy of such assumptions by describing the rich personal and social histories that refugees bring with them to the camps. 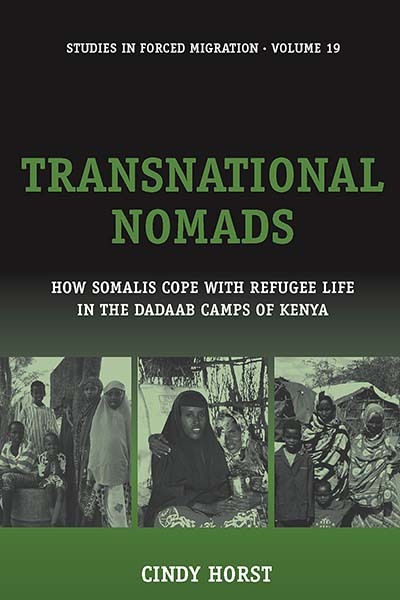 The author focuses on the ways in which Somalis are able to adapt their 'nomadic' heritage in order to cope with camp life; a heritage that includes a high degree of mobility and strong social networks that reach beyond the confines of the camp as far as the U.S. and Europe. Cindy Horst holds a PhD in Anthropology and completed a foundation year at the Refugee Studies Centre at Oxford University. She carried out extensive fieldwork amongst Somalis in Kenyan refugee camps and towns between 1995 and 2001 and in Europe and also worked for a refugee-assisting NGO. Cindy is Senior Researcher at the International Peace Research Institute, Oslo. Chapter 3. Refugee Life in the Camps: Providing Security or Sustaining Dependency?